When winter rolls around, many people start thinking about how they can keep heat from escaping through the windows of their house. Unfortunately, drafts can enter a house in many different areas, such as the entryway of a door. To remove drafts and leaks from all these points, weather-stripping is the best answer. When it comes to gaps around entryways, there are several factors that come into play. First, wood contracts and expands according to changing humidity. This adds friction to surfaces that already have a snug fit. Over time, this friction will slowly wear down the surface of the wood. Eventually, a gap will form and you’ll feel a draft. Another issue is that homes settle over the years, which explains why some old houses can be really drafty. Weatherstripping is adding a thin layer that’s placed in gaps between materials to help keep cold air out. You’ll find that there is a variety of shapes, materials and sizes. The perfect weatherstripping for your needs will depend on a few factors. Ultimately, weatherstripping should be easy to replace, install, repair, almost invisible and inexpensive. Those that are made from vinyl or silicone allow for a tight fit because they can be compressed between meeting edges. They are perfect for areas like the latch side of a door and stop molding. Some houses have many windows, often numbering into the dozens. Simple weatherstripping for windows could be a low-tack caulk that is applied to any gaps around doors and windows. It is placed in cracks that are closed during the winter months, and then is removed during the summer months. This weatherstripping will need to be applied every year, and takes about 10-15 minutes for installation on each window. Another type of weatherstripping is with metal. This type of weatherstripping requires a thin cut on the edge of the sash. A metal flange is then nailed into the inside of the window jamb. It provides an excellent sealant for windows. However, it also has quite a few shortcomings. For example, if the sash is taken out for painting or repairs, the weatherstripping must also be removed. It’s common for paint to build up on the top of the strip where it shows above the bottom sash. This can mean that lowering and raising the window past this cumbersome lump of paint could be nearly impossible. On sashes that are thinner, the the groove is cut so close to the perimeter that the sash could likely split if stressed. Additionally, the strip that interlocks at the meeting rail can require quite a bit of original material to be removed, something that can raise questions about preserving historic integrity. Any repairs to this weatherstripping is best done by simply replacing the material with something less invasive. Another popular type of metal weatherstripping is made from thin metal strips. These strips are nailed to the inside of a jam and sprung so the edge of the leaf is pressed up against the metal sash. They are easy to install, but can be tedious because they require placing nails every inch and prying up the unfastened edges to construct a snug fit against the sash. This weatherstripping is typically made from brass, bronze, copper or zinc. They don’t corrode easily, but are still stiff enough to retain the spring needed to keep air out. Additionally, there are quite a few plastic strips and bulbs on the market that are effective and easy to install. If they are backed with an adhesive, they can be installed in a few minutes, last for years and can be easily replaced. When it comes to the best sealant, plastic and metal can both be effective. It’s best to determine the type that will work for you based on your windows. While it is possible to weatherstrip your doors and windows by yourself, it is best to have a professional do this for you. One of the main reasons is because they can recommend the type of weatherstripping and materials that works best for your windows and doors. They can also install it in a way to prevent damage and suggest required maintenance for the weatherstripping. When it comes to weatherstripping, there are a variety of materials and ways to get the job done. It can seem like an overwhelming task to accomplish, but we are here to help. 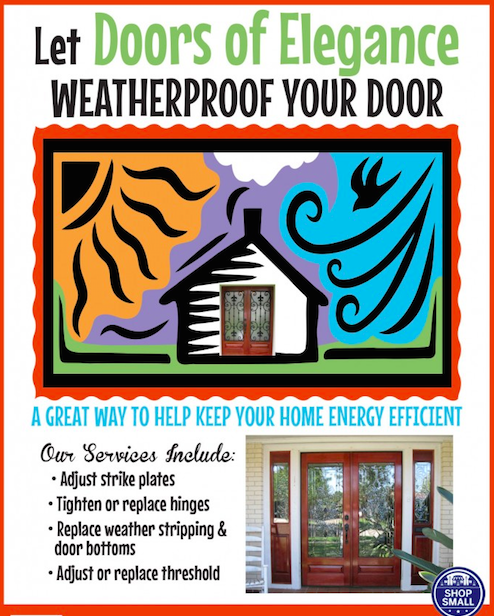 Contact us today to see how we can help you with your weatherstripping needs, no matter what type of weather.